Last year about this time, I saw an add on a kill pen Facebook page for a mare. Supposedly heavily pregnant, gentle, needed out of there ASAP because she was getting picked on by the other horses and not being allowed to eat. I was given an age of 16 (looking at her teeth I think she’s probably closer to 20). She was one big mat of burrs in both her mane and her long tail, and you could count ribs and hang Christmas ornaments off her hip bones. Since I’d had experience foaling out my own mare nearly five years ago (plus my college education in equine science), and also knew that seniors (horses, cats, dogs, etc.) often are harder to adopt out, I crowdfunded the adoption fee and named her Holly. Holy a couple of weeks afters he arrived. All the burrs were brushed out of her mane, but look at those eyes. She’s not quite sure what’s happening. She arrived with no trust. While several parts of her story proved to be false (She wasn’t pregnant. She was a good girl, but also very high strung. ), some made sense. I’d been told she’d been used in a feedlot to move cattle around. 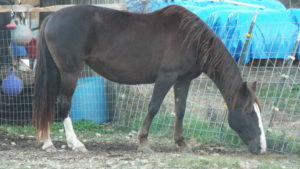 I believe she’s a gaited horse; certainly she’s far flashier than my paint and my grade stock mare when she moves. I also think whoever used her, pretty much never asked, always demanded. She still is head shy, though she’s getting better, and she’s learned that in this home, people come with a soft touch, a scratch on the withers, and quite often food. In September she grew tired of being confined away from my other three horses, though she could socialize over the gates. 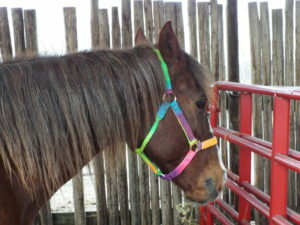 I’d hoped to do more fence work before I turned her out, and well, my anxiety was getting the best of me. So, she did what any smart horse would do. She let herself out into the main herd. 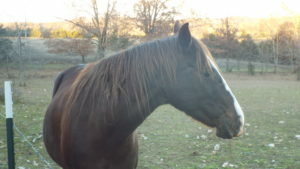 I stepped out one afternoon for a breath of fresh air and to admire my horses, and I had four, not three, in the pasture. 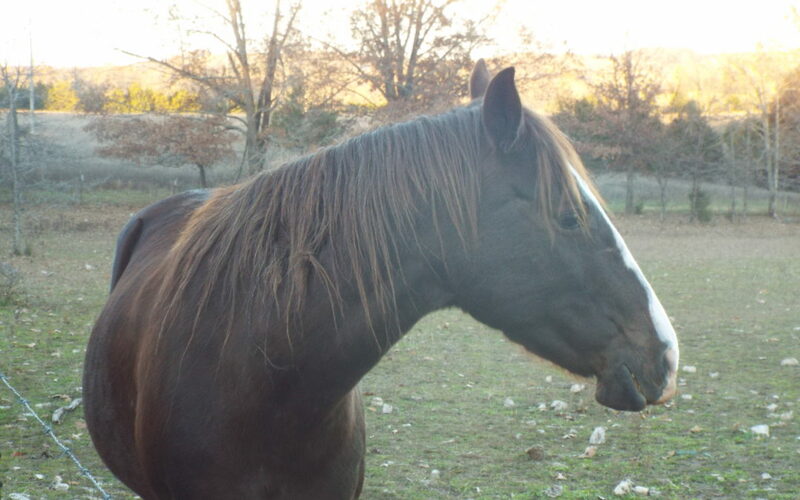 The integration went smoothly, and I was pleased to see that she’d befriended my five year old, as well as my gelding (My senior mare whom I’ve written about is Empress of the Pasture and chief herd mare.). Holly last night. She’s getting some love to brush her mane out again. Her hair is so long it knots easily. But she’s certainly lost the wary look in her eyes. She now willingly comes to me, even to be haltered and groomed. She is happy to accept a treat or a cookie. And is very respectful when you work with her. While there are many issues with the Facebook rescue groups (there are good and there are bad) and kill pen saves especially, I firmly believe Holly came here for a reason, and a year really has shown what love and good care can do. Look horse mom, no ribs! No hip bones! I look like a well nourished, well loved horse.